For many years, I have been teaching a subject in general biology classes that I call the Ecology and Evolution of Disease. It includes the subject that is now called Evolutionary Medicine (it now even has its own journal). I continue to be amazed that no general biology textbooks seem to mention it. I grew up thinking what most people still think about health and contagious disease. As Ogden Nash wrote, “A mighty creature is the germ, though smaller than the pachyderm...” It was all very simple. Germs caused contagious diseases. The solution was to kill the germs. Problem solved. But it is not so simple, and the book that opened my eyes to the real complexity of health and disease was Man Adapting, a 1965 book by René Dubos. It was an old book when I first read it in the late 1980s. It was ahead of its time, and maybe still is. Dubos’s main point was that health is a creative response. It is delimited by biology and evolution but it is highly personal. That is, a disease can take a different course in different individuals. Dubos said that, when we ask what man is, we should not be satisfied with the answer that he was an ape. Instead, we should think of ourselves as ecosystems in which health is the result of the proper balance of all of our physiological processes, as well as all the microbial species that call our bodies home. Dubos wrote about how the human body is an integrated whole, and conditions of the body can alter the course of disease. For example, stress can affect the immune system, with the result that bacteria that are already present but unnoticed can flare up into disease. This is now well known. The stress of viral disease can make a person susceptible to bacterial infections such as sinusitis and pneumonia, caused by “germs” that were already present. The stress of allergies caused me recently to have severe sinusitis. We have all seen examples of people who, from stress and its related habits such as smoking, seem to always be sick. 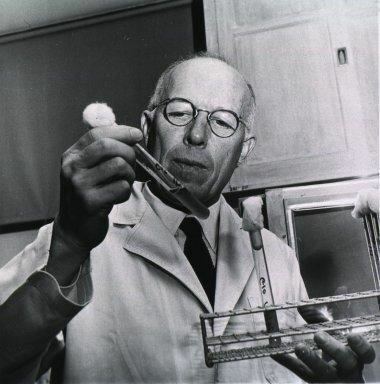 Also, Dubos may have been one of the first scientists to write extensively about how an upset to biological rhythms can result in disease, including infections. And the effects of stress can pass on from one generation to another. A mother animal who experiences stress can have behaviorally abnormal offspring, and it might result in part from the effects of stress on the prenatal environment of the fetus. Dubos also included a lot of information about how Old World diseases killed up to 90 percent of many Native American and Polynesian populations, because they had never evolved resistance to these germs. Why didn’t the Europeans die of New World diseases? Because there weren’t very many. America was populated by immigrants from Siberia, and Polynesia by people sailing long distances in boats. Only healthy people could have made those journeys. This opened my eyes to a whole new understanding of some parts of human history. After Dubos, many historians have written about this. An important, and still often ignored, aspect of our body ecosystem is its microbial inhabitants. Gnotobiotic animals (born, raised, and maintained in totally sterile conditions) are abnormal. Their organs develop abnormally, and so do their immune systems. They heal more slowly from injuries. Many parts of our bodies, especially the skin and digestive tract, harbor trillions of bacteria, most of which are harmless, and some of which are beneficial. Some of the beneficial ones produce molecules which, to them, are wastes, but to us are vitamins, especially B vitamins. In our intestines, the lactobacilli and bacteroides are beneficial, while bacteria such as the famous E. coli are usually harmless. E. coli just seem to be along for the ride. In rodent colonies with normal intestinal bacteria, kept in total isolation from the outside environment and other rodents, the E. coli gradually disappear, leaving the lactobacilli and bacteroides to dominate. But even the merely non-harmful bacteria can do us some favors by crowding out the pathogenic bacteria. This is the ecology of disease within a human body. (There is also the ecology whereby bacteria spread from one host to another.) But evolution also plays a role. This was the book where I first read about how many disease organisms have evolved to become less virulent. For example, many diseases, such as smallpox, leprosy, and (a disease Dubos and his wife studied) tuberculosis became less and less deadly over the course of many decades even before the introduction of antibiotics and antiviral therapy. Some infectious diseases have pretty much evolved themselves out of existence. One example is the English sweating sickness, which was a severe plague from 1485 to 1551. Its main symptom was profuse sweating. Then it vanished. Perhaps, Dubos speculated, it evolved into such a mild form that nobody noticed it after 1551. I knew he was right as soon as I read his book, because I could think of my own stories. I had read many gruesome stories about smallpox. But my own grandmother had smallpox. For her, it was a severe but not deadly disease, and did not leave pock marks when she recovered. She had become infected with a relatively mild strain of smallpox. Before the WHO began its campaign of worldwide vaccination to eradicate it, smallpox was already on its way out. I also knew this from direct experience. I grew up in Tulare County, California, after which the disease tularemia is named. It is endemic to the area, and probably everyone who lived there had gotten it. Only, for us in the twentieth century, it was a mild disease that we mistook for the flu. I did not know I had had it until I tested positive for tularemia antibodies when I was a teenager. How can a disease evolve to become milder? The simplest explanation is that a horrible germ that quickly kills its host cannot easily spread to a new host after it kills the first host. The first host is too sick to get up and spread germs around, and everybody stays away from him if he tries. Also, some people are naturally immune to the disease, and they are the ones who survive the most often. But the main reason is that the mild germs are the ones that are successful at spreading to new hosts. This is the evolutionary process of balanced pathogenicity. It was scientifically demonstrated by a study on a rabbit virus, myxomatosis, in Australia in the 1960s. The rabbit populations evolved resistance to the virus, and the virus populations evolved into a milder form. It was this book, Man Adapting, that changed many of my views of science, making them less linear and more holistic. In its twenty volumes, an immense amount of information is crammed. It was intended for children 6 to 16, but I doubt that even 16-year-olds could handle it back in 1951, certainly not now. It was the strangest mixture: Mary Had a Little Lamb would be right next to a long article about English portrait painting during the Restoration, and pages of unclear black and white photos of cathedrals. This set of books struck me, a writer, as a really bad idea from the start, but somehow The Book of Knowledge persisted for at least 40 years. There were pages and pages of “birthday congratulations” for the encyclopedia on its fortieth printing, even one from Bing Crosby, who carefully avoided saying whether he had ever actually read anything from earlier editions of the book when he was a kid. But I actually enjoyed looking through The Book of Knowledge recently. I do not have television or internet in my second house, where I was confined to recover from the antibiotic-resistant infection of which I wrote earlier. To me, looking through these books was a fascinating glimpse into the past: How to send a telegram, how telephones (the old black bakelite ones) worked, how card catalogs worked in libraries, how sorting machines were used on census cards, how motor cars are made. “Could we ever travel to the moon?” Fun with your typewriter! (You can make faces on typing paper with it.) Wax cylinders for temporary recordings from which secretaries could transcribe letters! The Book of Knowledge was extremely American-oriented. Under “The Distribution of Wealth,” the entire discussion was about capitalism, which also dominated “How Wealth is Created.” At the same time, one passage said that the assumption upon which taxation is built is equality of sacrifice of both rich and poor. God, where did that idea disappear to? We need it back. Despite the American bias, The Book of Knowledge presented all the parts of the world equally and, by mid-century standards, without judgment. All religions were treated equally. Women of every race were beautiful, men handsome, and every culture had its own brilliant literature and music. The encyclopedia did not talk about the early civil rights struggles; instead, it included a big section about outstanding American “Negroes,” which was the honorable term at the time, leaving the reader to conclude that black people deserved far better than what they were getting. And the books told kids how to do some things that were, at least at the time, important, such as how to do first aid, how to knit, how to make a whistle, how to make a violin from a cigar box, how to make a princess petticoat for your doll, how to cook. There were classic stories, everything from Guy de Maupassant’s The Diamond Necklace to Dickens’s A Christmas Carol. They were always nourishing and uplifting even if, like Maupassant’s story, the ending was a little tragic. But there was something in this set of books that is often missing in modern education: a sense of wonder. Over thousands of pages, the book asked questions about things that kids had seen many times but never thought about. The wonder of a piece of silk! Does a plant go to sleep? Why is it good to boil potatoes in their jackets? How do chemical bonds form? (Smiling atoms looked at each other and said, “Got any room for a lonely electron?”) How do plants move and feel? And the life of a tree: “How thrilling would be the story of trees if only they could speak!” This sense of wonder was the best thing about this set of books. The strangest part was how the books were organized. They weren’t. One topic was smooshed against another at random. As a result, each volume had to have an outline at the beginning to classify the topics and tell which page they were on, and Volume 20 was an index. Very confusing. No wonder that the New Book of Knowledge, which replaced this old one, is alphabetical like every other encyclopedia. On the other hand, all of knowledge is interconnected. That is the way the world is: each bit of knowledge is mixed in with other bits. The kids were expected to just read through the Book of Knowledge and have their knowledge enhanced in every way at the same time, a carnival of sensations. I wonder if it might not be time to go back to this sort of non-arrangement. If such a set of books was online, then you could search for any topic you might want by pressing Control F. I hesitate to admit that this old Book of Knowledge was organized somewhat the way my brain works! As a matter of fact, when I was a kid, I used to imagine that I would lead a big research institute in which all knowledge would be encapsulated. I started a list of topics, in which birds had equal standing with bubbles. I imagined that I would complete the work and die happy at age 103. I soon recognized that it was impossible to gather all knowledge into one place. But I will never lose my passion for the interconnectedness of all knowledge. What Does a Scientist Do When He or She Gets Sick? I mean, besides griping and whining like everyone else. And feeling embarrassed for sneezing in front of a class. And I don’t mean an ordinary sneeze. I mean a convulsive one that makes me bend over double, one that is uncontrollable, and which makes me invent new consonants. Red Skelton did a comedy routine about this once. What do we scientists do when we get sick? We test a series of hypotheses, that’s what. It keeps our minds occupied even though we may never find out which hypothesis, if any, might be true. When I became sick over a month ago, I tried to figure out what it was. I first assumed it was allergies. Allergies are famous in Oklahoma. I got a severe sore throat one night, assumed it was a cold, Hypothesis 1, but it was gone the next day, to be replaced by all the usual symptoms of either an allergy or a cold. Lots of other people had the same experience on the same day, which just happened to be the day the rain stopped and a strong wind came from the south during cedar pollen season (Juniperus ashei, abundant in Texas). How likely was it that I had an infection when everybody else had allergies? The rain came back and our windshields ran yellow with cedar and elm pollen. That was hypothesis 2: allergic reaction. But it didn’t go away. I assumed that Hypothesis 1 had been correct. But nine days later, I still had this cold. Maybe, I thought, it was a bacterial infection, Hypothesis 3. Maybe the allergic reaction weakened my immune system, making me vulnerable to bacteria that I already harbored and which had been waiting their chance to invade me. Evidence: yellow snot. Not just from breathing pollen, but even when the pollen had been rinsed away by more rain. Ten days of amoxicillin seemed to help. At least my sense of taste returned. But my cough and congestion continued. I went to the clinic again. My snot was now clear, so the conclusion was that Hypothesis 2 had been correct, and I got an allergy shot. By the beginning of the fourth week of whatever-the-hell, I was beginning to think of bacteria again, because the allergy shot brought no relief. I thought it was working, but this was bias on the part of my brain. My snot was yellow again, and there were the convulsive coughs, along with abdominal muscle pains just from the coughing. I have already used more tissues than I typically do in two or three years. But this is Hypothesis 4: amoxicillin-resistant bacteria. Antibiotic-resistant bacteria kill thousands of people. They are the premier example of the statement I used in my encyclopedia: What you don’t know about evolution can kill you. If I had not studied evolutionary medicine, I might never have thought of Hypothesis 4. Most infections, even bacterial ones, are self-limiting, which means you eventually get over them in a few months or decades. But I have too much life that I want to finish before I die, so I hope it doesn’t take this long. And recovery is not guaranteed. Weep not for me, gentle friends, but for the books I will not have a chance to publish unless I recover. As of this posting, the second-line antibiotic seems to be working. If it does not, I hereby authorize my heirs to post a notice on this blog. I was in the mood for hypothesis testing because I was reading This Is Biology: The Science of the Living World, by the late great Ernst Mayr. He wrote the book when he was 92 years old; he died at age 100 in 2004. It is thick with information, but pleasantly written (even with a joke or two), and I could relax in the assurance that he had figured out the philosophy of science so that I did not have to. He was not a great fan of philosophers; during the height of Karl Popper’s popularity, he said that every scientist he knew claimed he or she was a Popperian and then went ahead and did whatever he or she was going to do anyway. If I did not have to sit at home, I might never have looked at this book. Hypothesis testing helps us understand reality, but it also helps take our minds away from the reality that would depress us. May the Spirit of Science Be With You! If you can, find some time to sit back with a copy of my latest book Scientifically Thinking and read it while sipping your favorite drink. Preferably a book you have bought rather than borrowed from the library, though enough libraries have purchased it that you can probably look at it first before buying it. The most interesting response I have so far received was an email from Gary Spedding, a distillation quality consultant, a member of judging panels for distillation quality, and a contributor to the magazine Artisinal Spirit. (I like to think the title refers both to alcoholic and to creative spirit.) Trained in biochemistry, Gary runs the BDAS (Brewing and Distilling Analysis Services) website. Although British, this Gary is not the same Gary Spedding as the notorious British (brutish?) Holocaust denier by the same name. Gary shared with me an article that is to be published in an upcoming issue of Artisinal Spirit. It is safe to say that I have little experience with this field of study. 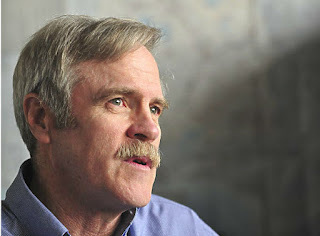 And I think that Gary probably already knew most of the things that he wrote about my book in his article before reading my book, but my book gave him a framework to organize his thoughts and to show that his work is not entirely different from the work of those of us who call ourselves professional scientists. Below I will mention some of the topics in Gary’s article, to show you some of the scientific considerations involved in the practice of good beverage distillation. Distillers already know these things, as evidenced by Gary’s articles and references therein, but many need some clarification. The concept of terroir. I did not know that distillers worked with this concept, though the French wine industry is largely based upon it. Terroir comes from the word for earth, and it means that wine made from grapes raised in one location, say Bordeaux, is very different from an otherwise identically-produced wine made from grapes grown in Alsace. Theoretically, this could apply to almost any agricultural product—I suppose sauerkraut (choucroute) raised in Alsace would taste different from choucroute raised in Bordeaux, that is, if they raise any in Bordeaux. Since it is hotter and drier in Bordeaux, I’ll bet the Bordeaux choucroute would be more bitter. But I had supposed that any terroir-associated differences in the grains used to make whisky or gin would have been lost during distillation. Perhaps I was wrong about this. Gary pointed out how easy it is for an individual, or even a tasting panel, to be biased in its detection of terroir quality (please, Word software, quit changing this to terror). Tasting panel bias. Humans are all biased, and a panel of expert tasters is no exception. Individual tasters can be influenced by other factors such as color. As Gary pointed out, tasters might think that a darker whiskey tastes better. Also, the taster should do his or her test at a time of day and under circumstances in which bias would be minimized, for example, at least an hour after using toothpaste, but during a time of peak sensitivity, e.g., mid-day. Also, in a panel of judges, some individuals can influence others. If one of them says “Ah!” this must surely influence the others. Are all the tasters blindfolded in individual cubicles? And just how objective are the panelists? Do they enjoy tasting the samples so much that they become the equivalent of the field zoologist’s “trap-happy animals”? (See page 143 of my book.) I wrote that all humans are biased, even scientists, but scientists try to compensate for it. Gary improved on what I said by entitling one of his sections “If you’re biased and you know it clap your hands...” Maybe what you want in a tasting panel is not uniformity of expertise but diversity of tastes, in which case—you might not want to go there—pulling volunteers off the street might be more reliable than what the experts say. Sample size. A distiller cannot draw a conclusion from one vat, even if s/he has a control vat (whatever that might be) to which to compare it. How many vats? As many as possible? It really depends on your market. If you think “scientifically tested with thousands of independent samples” will sell more product, then do it, if it doesn’t cost more than your likely profits. A scientific rule-of-thumb for statistical significance is to use 30 specimens in each treatment. Is it worth it? Even the statistical tests must be done by expensive computer programs. Don’t use the same vat over and over; that’s pseudo-replication. Humans as measuring devices. Human senses are not reliable measuring devices. As Gary points out, the sense of smell (which responds to thousands of scents, unlike taste, which responds to only six) varies greatly from one individual to another. One individual might be unable to taste, say, ethyl acetate, while another finds it pleasant, and another dislikes it. Human senses are also influenced by the sequence effect: tasters will pay closer attention to the first sample than to the twelfth, especially if they swallow. (I don’t know whether they do. I have heard that there is such a thing as a spit bucket, so I suppose they don’t.) Even something like how long a bottle has been opened (since opening a bottle introduces oxygen and thus oxidation) can influence taste. Drinks consist of thousands of chemicals, as will anything of biological origin, and a taster cannot pay attention to all of them. But is this really an important consideration? It is, after all, humans who will be drinking it. A subjective (scientifically unreliable) opinion might be exactly what you want from the panel of tasters. Fundamentalist Christians insist that, since God controls the seasons and the weather, there is nothing that we can do to alter it. 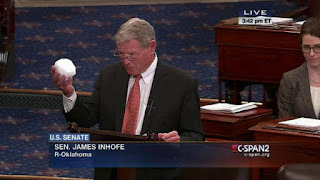 This is the basis for their insistence that, no matter how much carbon dioxide we release into the atmosphere, global warming will not occur unless God wants it to. That is, if God has decided that global warming will occur, then it will occur even if we totally cease all carbon emissions; and if God has decided it will not occur, then we can pour all the carbon we want to into the air and nothing bad will happen. The fundamentalists base this belief upon Genesis 8:22, in which God tells Noah right after the big Flood, “While the Earth remains, seedtime and harvest, cold and heat, summer and winter, day and night, shall not cease.” This verse does not say that global warming will not occur, so long as the seasons continue. There are no scientists who say that global warming will cause seasonal and geographical differences to cease to exist. But to fundamentalists, this verse means that God is in charge of climate and seasons, and that whatever happens on Earth is whatever God has already planned. We cannot reduce global warming by driving smaller cars, nor can a rich televangelist make global warming worse by flying around in a private jet. But the Bible also suggests in several places that God is also in charge of your lifespan. God has already decided how many days you are going to live, and there is nothing you can do about it. The verse that says this most clearly is Psalm 139:16, in which the psalmist records words he attributes to God: “Your eyes saw my unformed substance; in your book were written, every one of them, the days that were formed for me, when as yet there were none of them.” Fundamentalists usually use this verse to prove that an “unformed substance” (an embryo) is fully human (“my” unformed substance). Almost in passing, they acknowledge that this means our days are numbered. Elsewhere, Jesus says that the hairs of our head are numbered. I remember listening to evangelist Garner Ted Armstrong on the radio telling us all that his hair was falling out, and that if he counted them, he could calculate the exact date on which he would become bald. He seems to have been unaware that, in most cases, when a hair falls out of a follicle, a new one grows back. Perhaps “numbered” just means “limited”? The hairs of our head, and the days of our lives, are finite, and we should be mindful that we will not live forever, and we had better get our lives in shape before it is too late. This is a good interpretation, but is not a fundamentalist one. The psalm says, regarding “the days that were formed for me,” every one of them. Each day of our future was written individually in God’s advance plan. In another psalm, the psalmist said that our lifespan was limited to 70 years (or, he concedes, maybe 80). I knew someone who literally believed he would drop dead on his 70th birthday. But most fundamentalists would say that only God knows how many days we will live, and each one of us has a different number of days. This assertion is scientifically untestable (how could you ever prove that someone died on a day different than the one written on God’s secret list) but seems to be a straightforward literal interpretation of Psalm 139:16. If fundamentalists then took this verse one step further, they would have to conclude that your number of days is predetermined, no matter what you do. Don’t bother with eating healthy food; go ahead and drink and smoke; don’t worry about hiking or walking, just go ahead and sit on the couch and listen to televangelists and Fox News all day, because it won’t make any difference. Eating vegetables will not make you live any more, and eating fat and sugar will not make you live any fewer, days. Fundamentalists generally do NOT take this interpretation. Instead they say that God made your body and you should take care of it, at least a little bit. God is the tool of the fundamentalists. You would think that one advantage of being God is that you are in charge. But, poor little God; He has to do whatever the fundamentalists tell Him to do. This past week has been a banner week for global warming. We finally understand that President Trump has Godlike powers even over the weather. So, we have nothing to worry about. Trump will protect us from the consequences of global climate change. I assume nobody on the White House staff will read this, certainly not Trump. Another reason this is a banner week: Trump is appointing one of America’s most famous climate change deniers, John Christy, as his science advisor. Christy vigorously maintains that, because of his Christian faith, he will never believe that global climate change is occurring. But now he might have to reconsider whether it is God, or Trump, who controls the weather. Even if he does read this, I doubt that Trump would catch the sarcasm. We scientists like to think that our work is important. And it is. But sometimes we scientists get a little carried away and exaggerate the importance of our particular lines of research. 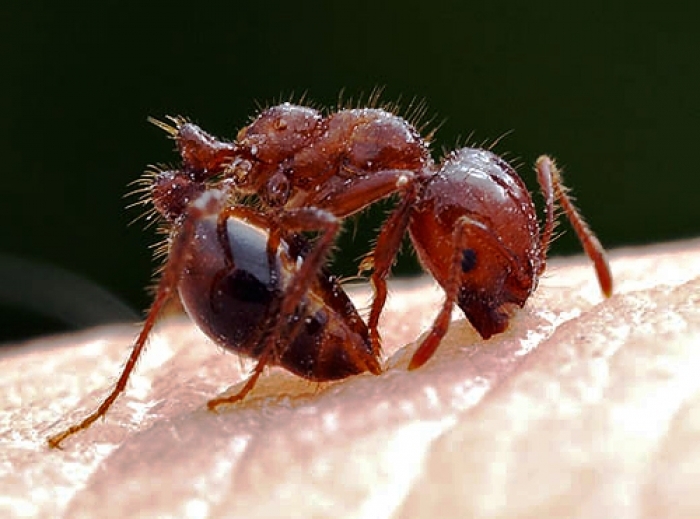 One example that I have personally observed is the invasion of the fire ant, Solenopsis invicta. Fire ants came from South America to Alabama about 1930, where the young naturalist E. O. Wilson, who went on to become one of the leading evolutionary scientists in the world, found them. They have spread inexorably since that time, restricted to warm wet areas. Right now, in Oklahoma, they live in the southern part of the state but not the northern part. And they can be a menace. If you disturb their nest, they will quickly swarm all over you. And they swarm over and eat some ground-nesting birds and young mammals who cannot run away. They have even killed a person, as told in this news report. They once crawled up the river of snot from a little boy’s nose, very quietly, and when he moved they attacked him. He lived, I think. There is an annual meeting of Imported Red Fire Ant (IRFA) researchers. I went to two of the meetings, back when scientific travel money was easier to obtain. Both years I presented results of small research projects (it was never a major focus of my work) about the effects of fire ants on plants. I was the only botanist at the meetings. It is understandable that some scientists would study the fire ants, especially since they are a potential menace. It is important to monitor where they are and what they do. And they have astonishing behavior. 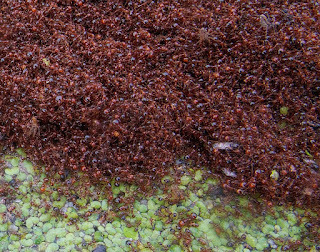 Not unlike army ants, they can lock themselves together in a clump, and can float in water. That is how they came across the Red River from Texas into Oklahoma. But, as it turns out, fire ants have not been a major threat. Cold temperatures and dry conditions have stopped their northward and westward spread. Central Park is safe. 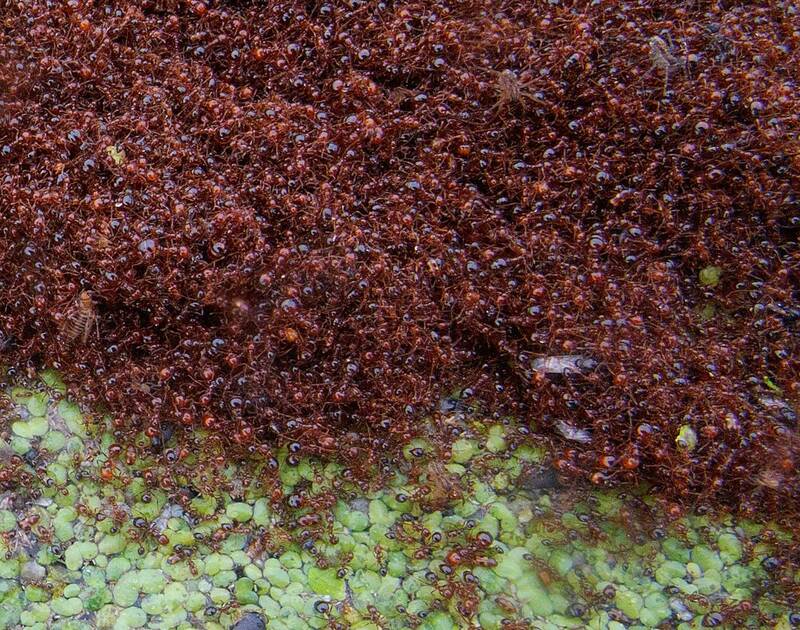 They have spread to California, perhaps in nursery soil, but fire ants are way down the list of threats to the health and safety of Californians. Ground-nesting birds have not been driven to extinction by them, and you are about as likely to be killed by a meteor as by fire ants. But we wanted to make our work important. So we emphasized the potential threats that fire ants posed to public health and safety, and to the economy. For scientists whose research programs were invested in fire ant ecology, it was important to do this. We did not spread deliberately false alarms about the Attack of the Killer Ants, but we put a spin on it that, at least subconsciously, was intended to scare funding agencies into supporting our work. Everybody wants to think their work is important, and our minds create a bias to this effect. Scientists are like everyone else in this respect. But the scientific method, at least, makes us scientists aware of our biases and requires us to present evidence for our assertions.